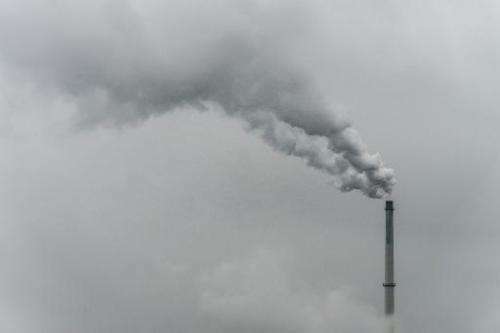 Germany is the European Union's worst polluter, with its production of CO2 gasses from fossil fuel rising by two percent in 2013 to 760 million tonnes, official data showed on Wednesday. Denmark registered a 6.8 percent increase in CO2 emissions, in Estonia it was up by 4.4 percent, followed by Portugal (+3.6 percent), France (+0.6 percent) and Poland (+0.3 percent). The strongest cuts in CO2, which account for 80 percent of the greenhouse gas emissions causing global warming, came from Cyprus, where emissions went down by 14.7 percent, followed by Romania (-14.6 percent) and Spain (-12.6 percent). FYI, carbon dioxide (CO2) is not pollution. It's plant food. The smokestack in the picture is from a sugar refinery that processes sugar beets. Most of the visible emission in the picture is steam. To date no one has been able to quantify how much man-made CO2 emissions are contributing to global warming. The equation for radiative forcing from CO2 suggests about 1 C increase for a doubling of CO2. Doubling pre-industrial CO2 levels of 280 ppm (circa 1880) to 560 ppm at the current rate will occur sometime around 2080. So in 200 years, humans may have possibly increased global temperatures 1 C. Since 1880, temperatures have increased approximately 0.8 C already so this seems plausible. The good news is human CO2 emissions will probably peak in the next few decades and will likely decline by 2080 even with no government regulation. Yea its because they have the only functioning economy in Europe. Turns out fellas it takes stuff to make stuff, and the stuff it takes weighs more then the stuff it makes. The Germans are powering the European economy – providing the CO2 grippers with the leisure to gripe instead of just refusing the benefits and embracing poverty. Germany will be on the the winners' side if temperature rises due CO2. Agriculture won't mind a few extra degrees or longer growth period, likely vice versa. Sure, they need to tighten their immigration laws to avoid chaos. The southern Europe, Greece and Spain etc. will be the sufferers, since drough likely gets worse there. The Germans are actually powered by the European economy. They're benefitting from the differences between economies in the monetary union, because there's no more exchange rates to separate the real cost of production from nominal prices. That's why Sweden, UK, still keep their own currency and Norway isn't in the union at all, while the others are seeing a net outflow of work and business and an increase in debt to - you guessed it: Germany. The issue is that the Euro is nominally worth an Euro in all the countries, but it really isn't. One Euro is worth more in Germany than elsewhere because Germany is getting all the business, which means they can afford lower taxes, wages, prices, and that brings more business into Germany. All the more reason to go ahead with the changeover to renewables as fast as possible. Agriculture won't mind a few extra degrees or longer growth period, likely vice versa. But we do mind the more ferquent floods which have been happening lately. Growing a bit more potatoes means nothing if entire regions get submerged for a few weeks and the crop rots. Remember that germany is rather small (about half the size of Texas). Whenever we talk of a 'local' flood we're talking an appreciable percentage of the country. Sure, they need to tighten their immigration laws to avoid chaos. If the start becoming energy exporters they could be the winners. They're ideally situated for gathering solar energy (in whatever form). Erm..you are aware that taxes, wages and prices are among the highest in germany compared to the rest of the EU? The countries with lower taxes and prices than Germany are the PIIGS and other poor countries that aren't in competition with Germany because their economies are unstable and dysfunctional and do not attract business. For the others, Germany is actually the cheapest of the richest. For example, the VAT in UK is 20%, Finland 23%, Denmark 25%, Germany has 19%. They also offer generous tax breaks for industry and agriculture. Where Germany is seeing businesses flee to the far east, the other European nations are seeing business flee to Germany, or if not that then they're up to their ears in debt to Germany like the PIIGS. There's basically a north-south divide in the EU with the rich north paying for most of the economic output and the south spending most of it, and Germany is sitting right in the middle of the cash flow. As Germany continues to decommission nuclear plants and build coal plants at break neck speed this trend will continue as renewables are lagging far behind in their promise for making up the difference in capacity. Yes, you Germans need to work on the rivers them to better withstand floods, but experts are quite sure you can do that. Other than that, you may one day be able to grow palm trees up to North Sea Islands of Germany, so no need to escape to Ibiza during cold winters anymore. We used to have space allocated for floodwaters (wetlands, etc.). But those spaces have been used for building houses in recent decades. If you look at the extent of the latest floods then those have been on scales that have been FAR beyond anything that could be contained by engineering solutions - even if the wetlands had been maintained. This is a problem that is here to stay and will hit us repeatedly and with increasing frequency in the future. Mitigation is the best we can hope for. Those islands aren't going to be around by then. They are already vanishing measurably due to sea level rise. Renewables have already made up for the gap. In germany there is currently more electricity being produced by renewables per year than nuclear ever did (even at its peak). On the other hand germany is paying most of the bailout money for Greece, Portugal and Spain. (and our income tax is top notch. I pay 42%. How much do you pay?). Yes, the union has certainly been good for germany since it has simplified exports and made prices compareable without having the (useless) money market in between. While 17% of Germany's energy is currently nuclear and 25% is classified as "renewable" that doesn't mean that 25% is clean. In point of fact 30% of that comes from Biomass. In point of fact 30% of that comes from Biomass. Even if you were to subtract those 30% biofuel as 'not clean': That still leaves 17.5% - which is still more than nuclear contributes. Not at all. The coal fire plants currently being built had been signed off on prior to the Energiewende. There are binding contracts in place. Of the 9 currently planned 3 are already stopped permanently (because they are judged to be uneconomical or because of legal issues). Only two are under construction. the rest are in a planning stage. Whether they will be built at all is questionable. Well this will take some doing wont it? "Energy in Germany is sourced predominantly by fossil fuels, followed by nuclear power, biomass (wood and biofuels), wind, hydro and solar." "Germany ranked sixth in global energy consumption between 2004 and 2007. Germany was Europe's largest consumer of electricity in 2002"
"Because of its rich coal deposits it has a long tradition of fuelling its economy with coal. It still is the fourth-largest consumer of coal in the world, even though domestic coal mining has been almost completely phased out"
"Germany imports about two-thirds of its energy"
... from Lebensraum lands, along with most of the fossil fuels that it does consume within its borders. That's not entirely true, in the next 100 years we predict an 80 cm rise in sea leavel in front of our coastline (netherlands vs north sea), besides this we calculated a worst case scenario of a 5 meter rise til 2130. Both technically and financially (it will cost less than 0,15% of our GDP/year) we are able to sustain this rise. -> I can hardly imagine the sealevel rise will pose a serious problem for zee Germans. more on topic, I don't quite follow German policy regarding energy. They have been greatly investing and subsidizing green energies, have quite some overproduction (German energy suppliers are dumping energy for incredibly low prices now), yet still decided to dig out and burn all the brown-coal, which is possibly the most dirty fossil energy available. it's either a kill-all-competition-in-Europe policy or a last attempt to still shoot out some CO2 while they still can, but the prices are so low and energy-embargo's are so restrictive, they are more so killing themselves. I'd say a bit of moderation in digging out brown-coal wouldn't hurt, yet apparently the energy exploiters seem to think otherwise. Maybe I'm wrong somewhere but I fail to see how. yet still decided to dig out and burn all the brown-coal, which is possibly the most dirty fossil energy available. There's two forces at work, here. 1) Popular and political will, which is driving the changeover (against the will of Merkel's majority party of the ruling coalition, mind you). 2) Capitalist interest of the large utility companies who get (subsidized) cheap coal because of laws/contracts which can't just be broken in a day (because Merkel's party is adamantly against cutting subsidies for big business). Coal is a cash cow business due to low carbon taxes and exemptions. The other issue is the minority party in the ruling coalition is traditionally the workers and miners party so they're not beeing too forceful in their objection to coal mining. Popular will is changing that. But it takes time. Unfortunately there are many entrenched big business players (and their politicians/lawyers) obstructing the changeover any way they can. bark bark bark. The sky is falling.